Hi Stampers. Are you ready for Easter? It’s coming up FAST! 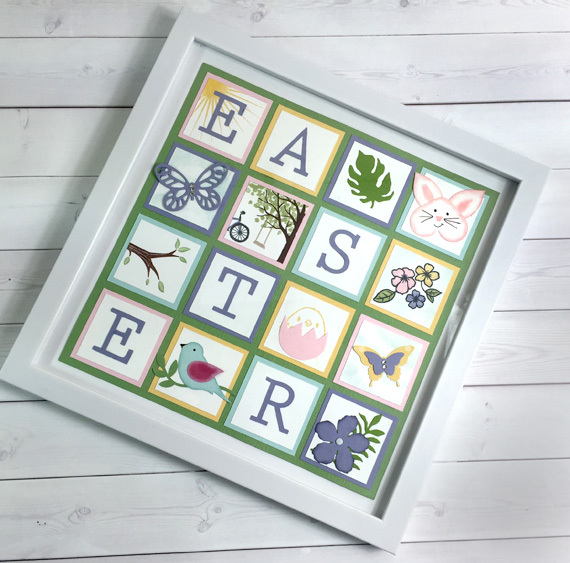 Today’s blog hop should give you some ideas of creative Easter ideas using Stampin’ Up! products. I hope you can find inspiration here. In looking for a stamp set to make an Easter card this year, I found that I did not have a current Easter set from Stampin’ Up! Therefore, it was time to improvise! I had seen on Pinterest that someone (of course now I can’t find it) had used the Sweet Little Something stamp set mixed with the Picnic With You Bundle to create a bunny in an Easter basket. So, I decided to give it a try. My card starts with a Soft Sky card base 8 1/2″ x 5 1/2″, scored at 4 1/4″. I then sponged some clouds in Soft Sky ink onto a 4″ x 5 1/4″ layer of Whisper White. For another card I had used the grass die from the Picnic Basket Builder Framelit Dies to cut grass out of Garden Green CS. It occurred to me that if I turned the leftover piece upside down, it still looked like grass. I adhered the grass to the Whisper White layer and trimmed off the excess and adhered it to the card front. The basket was stamped onto Whisper White CS with Soft Suede ink and die cut with the coordinating die on the Big Shot. I used the Layering Ovals framelit dies to cut an oval out of Soft Suede CS and then used a smaller oval from the same set to cut a smaller oval out of the middle of the first one. I matched the ovals to the picnic basket and attached it with Mini Glue Dots and cut off the bottom part of the oval, making this the handle to the basket. The bunny was stamped using Crumb Cake ink for all 3 layers and cut it out with my paper snips. I adhered the bunny to the basket and then the bunny in the basket was glued to the card front. There are many more project on the hop for you to enjoy, just follow along using the list below. Welcome to the Remarkable InkBig Blog Hop for April 2017. This month our theme is “Retiring 2015-2017 In Colors”. You may just be starting the blog hop here at my blog – Queen B Creations or may have come from the person previous to me in the list. If you get off track at any time, the full lineup below will help you move along from blog to blog so you see all the projects. I have to admit that the Stampin’ Up! 2015-2017 in-colors were not my favorite, but I will miss Tip Top Taupe and Mint Macaron, so I used those colors for the card stock in my Easter card. Can you believe that Easter is less than a week away??? I’m most excited about that because my hubby and I with be in the southern Caribbean on a cruise for Easter!! We are going to the ABC Islands – Aruba, Bonaire and Curacao on Royal Caribbean Navigator of the Seas!! Ten days of heaven, I can’t wait!! My card base is Mint Macaron, 8.5″ x 5.5″, scored at 4.25. I followed that with a 5.25″ x 4″ layer of Tip Top Taupe and then a 5″ x 3.75″ layer of Whisper White card stock. On the Whisper White layer I stamped the carrot from the Stampin’ Up! Basket Bunch stamp set in Cucumber Crush ink and colored in with a Pumpkin Pie marker. For my focal point I used the layering Ovals framelit dies. The scalloped circle is cut from Mint Macaron card stock and the plain circle in Whisper White. I die cut the basket in Tip Top Taupe for both layers. I used the foam strips to adhere the two basket layers together. I them cut the grass in Garden Green and stamped the bunny onto Whisper White card stock with Memento Black ink and cut it out with the matching framelit from the Stampin’ Up! Basket Builder framelit dies. I colored the inside of his ears with Pink Pirouette and the bow tie with Watermelon Wonder markers. The ovals are adhered to the card with Stampin’ dimensionals and the basket to the ovals with glue dots. The inside of the card is lined with a 5.25″ x 4″ layer of Whisper White card stock. I stamped the grass along the bottom in Cucumber Crush ink and the sentiment in Tip Top Taupe ink. The eggs were cut from the framelit with Whisteria Wonder, Soft Sky and Pink Pirouette card stock, while the bunny was stamped in Chocolate Chip ink onto Chocolate Chip card stock and cut out with the matching framelit. Thanks for taking part in our blog hop, there are so many amazing ideas and inspiration you don’t want to miss. Remember that currently you are at my blog – Queen B Creations, so check the blog hop line up list to see who is next in the list. If you have followed my blog much at all, you know that I love to do these card in a box explosion boxes. In honor of Spring and our Spring has Sprung Blog Hop – I have made a Easter card. This card features the Stampin’ Up! Easter Message stamp set. I used my basic card in a box card base design (found here) using Crumb Cake and Elegant Eggplant card stock and used Very Vanilla as my stamping layer of card stock. I stamped in in Memento black, Garden Green and Elegant Eggplant ink. I colored the cross and flowers using my Stampin’ Up! Many Marvelous Markers. The flowers, palm frond and cross were all fussy cut by hand using my Stampin’ Up! paper snips. Stampin’ Tip: When fussy cutting, keep your scissors in a comfortable forward position and turn the paper into the scissors, rather than turning the scissors around the paper. You get more control this way. 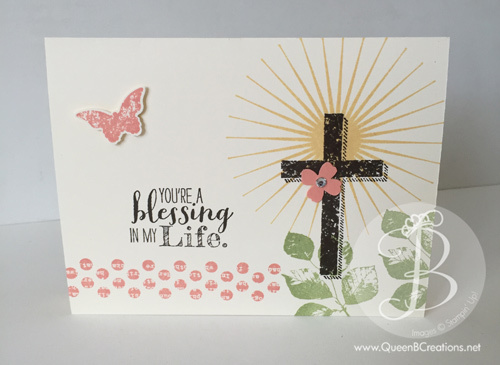 The cross is adhered to the back of the card with stampin’ dimensionals and the flowers and palm frond are adhered to the middle cross members with glue dots. The Happy Easter sentiment is adhered with glue dots and two small strips of acetate. I love that these cards pop up for display and then fold flat for mailing. A custom envelope can be made for this card with the Envelope Punch Board (5 1/2″ x 6″ envelope, 9 1/4″ square of DSP, first score at 4 3/8″). Hi Stampers. 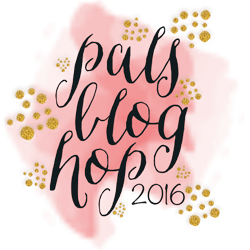 Welcome to the Pals Blog Hop for March 2016. We are thankful you stopped by to take a look at our new 2016 Blog Hop monthly themes. This month we are featuring Spring and Spring related projects. We hope you enjoy our creations. My “Spring” project is a wall art “sampler”. Recently, I opened an Etsy store (well I’ve had one for a while, but I really started working on it this year. I wanted to add more than just cards. I found this great frame at Hobby Lobby when we were in Reno for my birthday last month. It’s like a shadow box frame but the depth is very shallow (about a 1/4″ between the project and the glass. Just enough to give my flowers and butterfly a little lift. It was perfect for this project! The interior of the frame is 10″ x 10″. The Wild Wasabi background piece is 9″ x 9″. I then cut out sixteen 2″ squares in various spring colors (Pink Pirouette, So Saffron, Soft Sky and Wisteria Wonder). Then I cut out sixteen 1.75″ Whisper White squares. I cut out the letters that spell EASTER in Wisteria Wonder card stock on my Silhouette Cameo 2. I just got it a few weeks ago – I am IN LOVE!!! I’ve had a Cricut (didn’t like the need for cartridges – I know, they don’t now, but mine did) and I’ve had a Pazzles (very cool machine, but not very intuitive) – but for some reason, this one is SO much easier and there are a TON of tutorials online! Hi Stampers! I had a wonderful day on Thursday. A friend of mine, Cheryl, who is also a Stampin’ Up! demo came over and we spend several hours stamping! So fun! This card was one that Cheryl shared with me. This card starts out with a Baked Brown Sugar card base (8.5″ x 5.5″, scored at 4.25″). We stamped the sun from the Stampin’ Up! Kinda Eclectic stamp set in Hello Honey ink onto a 4″ x 5.25″ layer of Very Vanilla card stock. 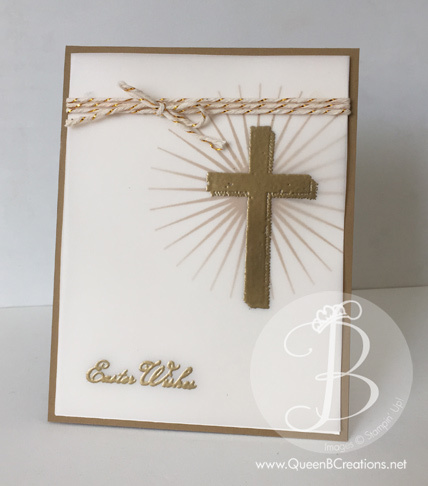 Next we stamped the cross from Blessed by God (and a retired Easter Wishes sentiment) in Versamark in and embossed with God stampin’ emboss powder and melted it with the heat tool. The vellum was attached to the Very Vanilla card stock with glue dots and wrapped gold baker’s twine around the two layers and tied a bow in the front. These two layers were then adhered it to the card base with snail adhesive. I have exciting news! Stampin’ Up! is offering FREE SHIPPING next week. Five days only! Get your wish list ready for Monday morning! Awesome weekly deals! If you don’t have the magnetic platform yet, here’s your chance to save $10 on it! Order it Monday and get free shipping, too!